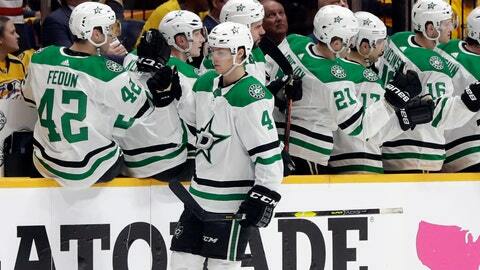 NASHVILLE, Tenn. (AP) — Miro Heiskanen turned in a postseason debut to remember, even if the Dallas rookie defenseman didn’t wind up writing himself into the NHL’s record book because of a late scoring change. An official scoring change Thursday morning gave Heiskanen’s second goal to Alexander Radulov for tipping the puck past Nashville goalie Pekka Rinne, turning a historic night for the rookie appearing to become the youngest defenseman in NHL history to score twice in his postseason debut into just a very good game. The rookie defenseman shot again with Radulov redirecting the puck past Rinne at 6:10 of the third. NOTES: Heiskanen set a franchise record with 33 points by a teenage defenseman. He also was one of only three Stars to play all 82 games this season. … Radek Faska was the last Stars rookie to score a goal in his playoff debut on April 14, 2016, against Minnesota, and Curt Giles was the last Dallas rookie defenseman with a goal in his postseason debut on April 8, 1980, against Toronto. … The Predators went 35-4-1 this season when scoring first and had been 24-7 all-time when scoring first in the playoffs.